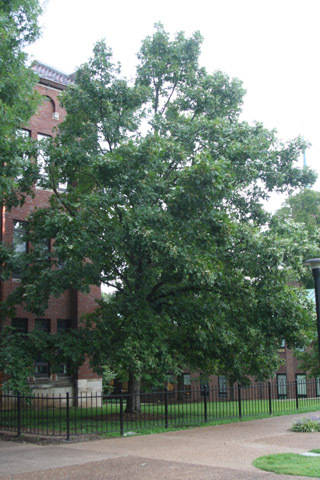 This tree is located at the southeast corner of Garland Hall facing Library Lawn, behind the wrought iron fence. The characteristics of bur oak are described more fully in the notes for the Bicentennial Oak, which is nearby. This smaller tree has branches near the ground, so you can get a better look at the leaves. This tree also often produces many acorns in the fall. This organism is a living specimen that is part of the  Vanderbilt University Arboretum  with the local identifier 2-412.